Was DC Looking to Boostle? 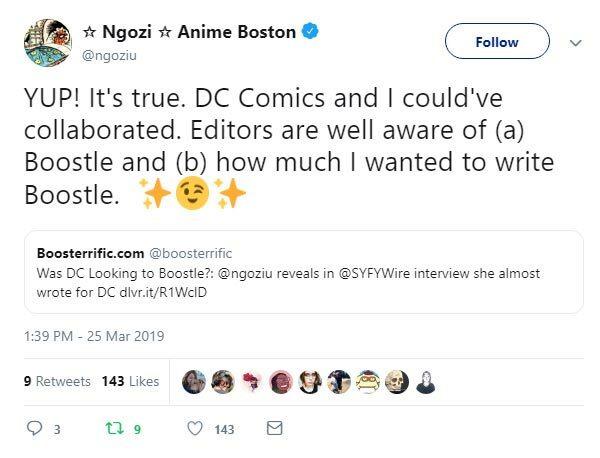 In a recent interview with SyFy Wire, Ngozi Ukazu revealed she almost had a job at DC writing for Blue and Gold. SyFy: There's a rumor that one of the Big Two came knocking after your second huge Kickstarter. What happened with that? Ukazu: It was actually DC Comics that came knocking and it just didn't work out. And that was fine. I think one reason it didn't work out is because I made a lot of demands. My attitude was like, “I don't have to work for you guys." SyFy: Because you had a Kickstarter that just made $350,000. Ukuzu: I'd love to write a Blue Beetle/Booster Gold epic. But if y'all don't want to collaborate, then we don't have to. I really like those comics but it just didn't work out. Ukuzu has made quite a name for herself with her creator-owned, character-driven, award-winning Check Please! webcomic that follows the misadventures of a young gay man finding his way in the world of collegiate hockey. Given her oeuvre and her success at building a devoted audience, it would have been interesting to see what she might have created if DC had given her the green light. Could we have had an official, DC-sponsored Boostle? Whatever her plans, we'll never know exactly how close DC came to signing on, nor should we read too much into the fact that DC was holding talks about a new Booster Gold comic. It happens all the time. For example, last year, writer Tony Lee, perhaps most strongly associated with Doctor Who comics, revealed via Twitter that he also had talks with DC sometime in the past decade about rebooting Booster. That obviously never happened either. The takeaway is that DC is always exploring new avenues to merchandise their characters. Sooner or later, when the company feels that the idea and artists are right, Booster Gold will be back making monthly appearance on the racks of your Local Comic Shop. You can read the whole Ukazu interview by Kamara Horne at SyFyWire.com. UPDATE 2019-03-25: Ukazu confirmed the meeting and her plans via Twitter. Who knows? Maybe she'll get a chance eventually. If there were eight villains, and Booster Gold defeated two of them, how many villains remain?